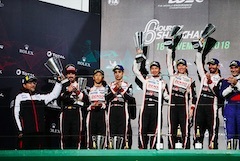 Toyota City, Japan, Nov, 19 2018 - (JCN Newswire) - TOYOTA GAZOO Racing overcame challenging weather conditions in China to win the 6 Hours of Shanghai, the fifth round of the 2018-19 FIA World Endurance Championship (WEC). The #7 TS050 HYBRID crew of Mike Conway, Kamui Kobayashi and Jose Maria Lopez won their second successive race, following victory at Fuji Speedway, to close the gap in the drivers' World Championship to five points with three races remaining. Sebastien Buemi, Kazuki Nakajima and Fernando Alonso in the #8 TS050 HYBRID retain the World Championship lead following their second place, while TOYOTA GAZOO Racing heads the teams' standings by 28 points as a result of its fourth one-two of the season. On the day when TOYOTA GAZOO Racing won the World Rally Championship manufacturers' title following victory on Rally Australia, changing and difficult weather conditions made for a challenging six hours for the WEC team. A minor improvement in conditions allowed a short green flag period around 70 minutes after the start and during this Jose ran slightly wide in the #7 which allowed Sebastien to claim the lead for the #8, prior to another safety car and red flag sequence. Track conditions slowly improved and the TS050 HYBRIDs stretched their advantage at the front. The final driver change with around 70 minutes remaining saw Mike take over the leading #7 with Kazuki in the #8 pushing hard to close the gap, setting the fastest lap of the race in the process. "This race was the start of the second half of this season so I am pleased to have another one-two victory, especially in such weather. We got the one-two finish we were aiming for but we found some things which can be improved in the future, when such situations occur again. 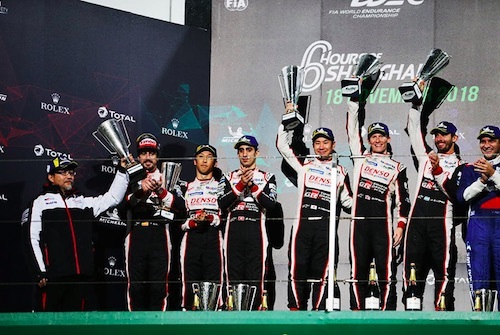 Finally, I want to give my big congratulations to our friends at TOYOTA GAZOO Racing WRT on winning the World Rally Championship today; it's a fantastic achievement in just the second season back." "It was not an easy race for me in those conditions; visibility was very difficult when it started raining at the end and the tyres were not up to temperature. I'm really happy with the result so big congratulations to the whole team, and thanks to my car crew and team-mates for another solid job. It's great to win and continue the momentum from Fuji, especially as it's the last race of the year. Now we will keep pushing over the winter so we can finish the season strongly." "The team did a great job and Mike and Jose did well; I'm really pleased to win again. My stint was a hard one because I came out behind the safety car and there were many other cars from other categories around me in heavy rain with very little visibility. I concentrated on minimising risk and overtaking cleanly, with the belief that the safety car would need to come out again. When it did and we were leading, I just focused on keeping a gap." "The team did a fantastic job today in very tricky conditions so thanks a lot to them. It is fantastic to have achieved the win today. From my side it was a short but really hard race. There was a lot of water on the track at the start and, as the first car, I had the advantage of better visibility but I was also the first to reach each of the rivers across the circuit. Fortunately I kept the car on track despite a small mistake at the hairpin." "I did the first stint when the conditions were very difficult but our car was strong even in these very wet conditions. Personally I am happy with my driving as I could take the lead from the sister car. I think we had a very quick car and the speed for the victory but the #7 crew had a bit more luck with their pit stops so the final result is a bit disappointing." "It was a difficult race in difficult conditions. We had a good car but we had bad luck with our pit stop during the safety car. I think we were unlucky for the second race in a row and I hope the luck will come back to us in the future. The year is over but the WEC season still has three races remaining and we will push to get back into the middle of the podium." "It was a tough race due to the weather conditions, the amount of water on the track and the safety car periods. Wet weather races are always very stressful, also in terms of visibility. I think we had a good, fast car and did the best we could; we were quite competitive today and could fight for the win. In the end it did not work out but we will try it again next time."